Bruised from the breakdown of her marriage, Esther Lomax needs to get away and hopes Malaysia’s unspoilt shores will provide the space and time alone she seeks. But a day’s boat trip takes a desperate turn when Esther, along with six other holidaymakers, is deposited on an uninhabited island, their guide promising to pick them up in an hours time. Only, he doesn’t come back: not an hour later, not two, not even the next day. Before long the dreadful reality of the situation hits the group: they have no way to getting back to the mainland and they know nothing about each other. As tensions erupt, secrets emerge and time begins to run out, Esther must ask herself the ultimate question: will she leave the island alive? I chose the book because of the sub-title ‘If no one knows your missing how can you be found?’ It sounded very intriguing which encouraged me to pick up the book and read the blurb. The book focuses on Ester the main character and how she ends up stranded on a Malaysian desert island. Her and 6 others are going on a daytrip to a desert island on a boat and the tour guide doesn’t come back for them. She doesn’t know any of the people she’s with at the start but as the days go on everyone starts telling their individual stories and come to realise why everyone ended up in Malaysia to start with. As the days turn into weeks, they start getting agitated and paranoid and blaming each other for being there – one character in particular. Within the main story there’s a “sub” story that’s running at the same time and for most of the book you have no idea why until about 3/4 of the way through when you realise it’s actually connected to one of the people on the island. It was an extremely good plot and it was good to see how the main character, Ester, changed and grew throughout the book. There was a real diverse mix of characters; an older couple, two “newly-weds”, a lesbian, a divorcee and a very private single bloke and it was great to see how each character copes with being on the island and how some of them step up and take lead and show their capabilities in the face of such a disaster whereas others crack under the pressure . I liked the end, when it finally came and what brought each individual character to Malaysia in the first place and the twist was something I really didn’t expect. I would definitely recommend this book and will be looking for more Emily Barr novels in the future. 1. 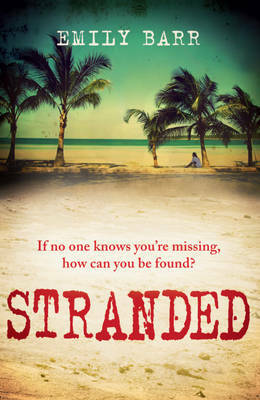 Hi mum – in your own words can you tell us what Stranded was about? It was about a group of people getting stranded on an island and no-one knowing they were there. 2. Have you read anything else by Emily Barr, if so, which ones? Yes I have – The First Wife. 3. Would you recommend Emily Barr novels? I like Dorothy Koomson. Mike Gayle books are always a good read and I also like Diane Chamberlain and Jodi Picoult. 5. What are your top 5 favourite books of all time? The first one is a classic it’s got to be Great Expectations by Charles Dickens. The Lion The Witch and the Wardrobe by C.S Lewis, The Curious Incident of The Dog in The Nigh time by Mark Haddon, Nineteen Minutes by Jodi Picoult and it’s got to be The Rats by James Herbert. 6. If you were stuck on a desert island and could only take 3 books with you what would they be? How To Build A Raft by Anybody. The Survivors Handbook and A Brian Cox book so I could spot all the stars. 7. Ha-ha, very funny. If you were to write a novel which genre do you think you’d pick and why? It would be a horror because you could let your imagination run wild. 8. Is there a book that you’ve always wanted to read but never got around to? 9. What book is next on your reading agenda? At the moment I’m reading Ash by James Herbert. 10. Thanks for answering my questions. Can you make me a cup of tea now? *Looks puzzled* Is that a question?